Most of the time, I skip breakfast. I know, they say you're not supposed to, most important meal of the day, blah blah blah – but a cup or two of my inartfully home-brewed coffee first thing in the morning and I'm usually good to go. And yet, I actually love breakfast foods, especially those on the savory side of the aisle: eggs, toast, bacon, sausage – these are all wonderful delicious things. And I'll gladly eat them any time of day. 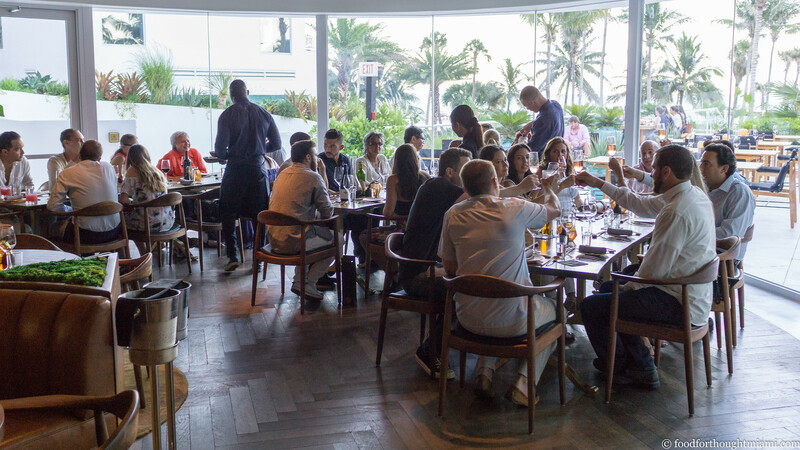 So I was pretty excited when I heard about All Day, a spot that recently opened in the "Arts & Entertainment District" on the northern edge of downtown Miami. 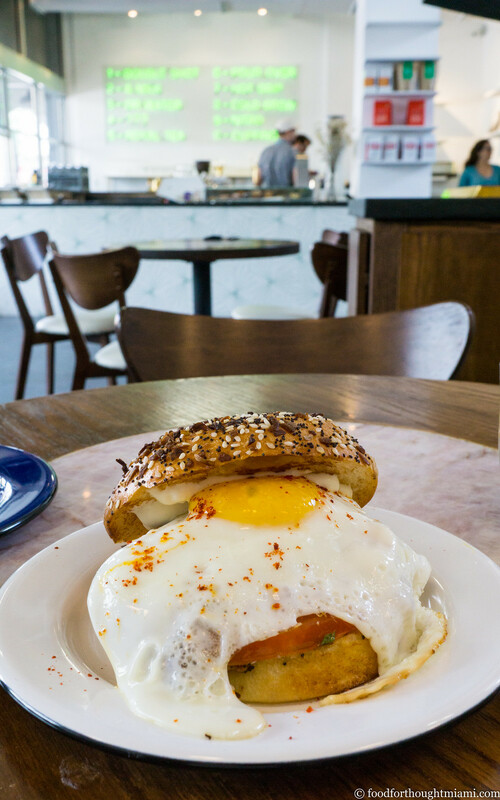 The concept is pretty straightforward: good coffee and egg dishes, served all day. I was even more excited when I learned it was run by Camila Ramos, the talented barista and former head of Panther Coffee's retail operations. 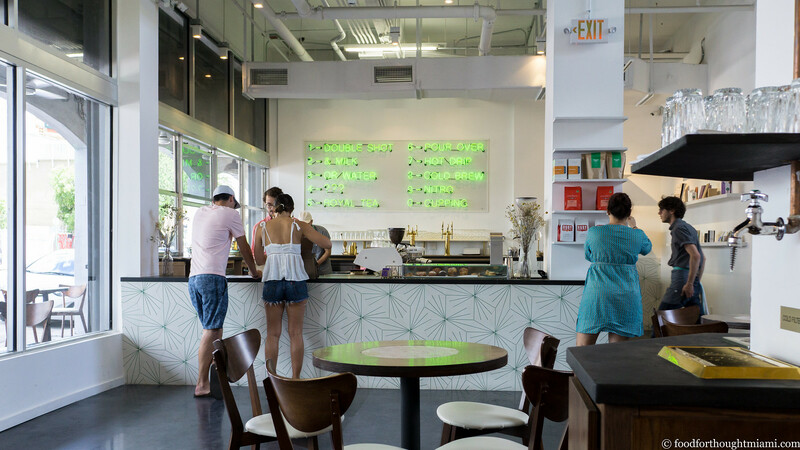 The coffee menu at All Day – posted on the wall in green neon behind a massive Marzocco espresso machine – is a bit enigmatic and designed to foster a conversation. "01 - Double Shot" is straightforward enough, a double shot of straight espresso (pulled with Ruby Coffee Roasters' Creamery Blend; the Panther alumnae is now a free agent and uses beans from several different roasters). But "02 - & Milk" requires some more user input: what's your preferred ratio of milk to coffee, do you like your milk foam wet or dry? (You can see all my pictures in this All Day - Miami flickr set). The ten choices also feature drip, pour-over, and cold brew coffees, including a nitrogen gas infused version with the thick, frothy texture of a well-pulled Guinness; esoterica like "Royal Tea" (an infusion of coffee cherry husks and evaporated milk, also given the nitro treatment); and a rotating daily special (currently a concoction of cold brew and rosemary limeade). I am not really a coffee geek, and won't pretend to be. 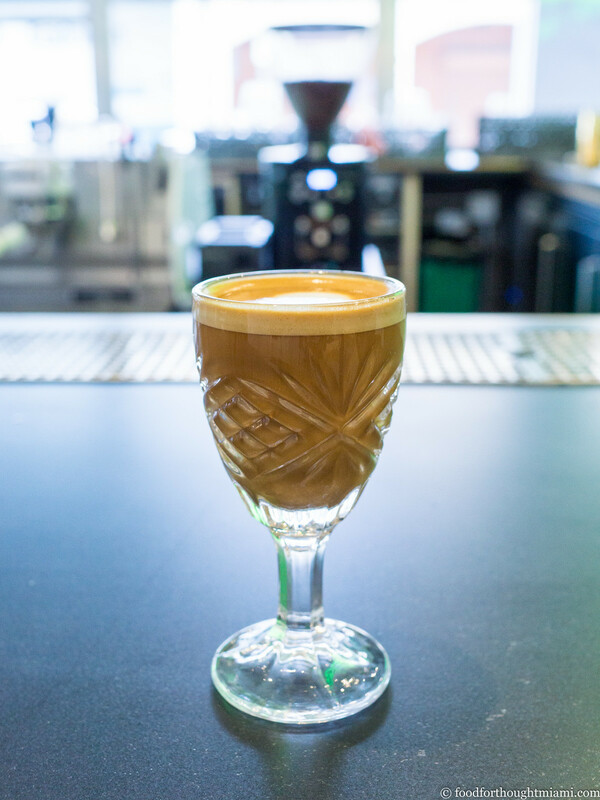 So I can't tell you much other than that the espresso I had on my first visit was bright and rich and creamy; the "& Milk" I had on my next visit, with a 2:1 espresso:milk ratio (in Miami we'd call this a cortadito; in San Francisco you might call it a "Gibraltar"), was even better. I usually drink my coffee black, but the short pour of milk nicely tempered the acidity of the coffee. Can we talk about something I actually know something about? 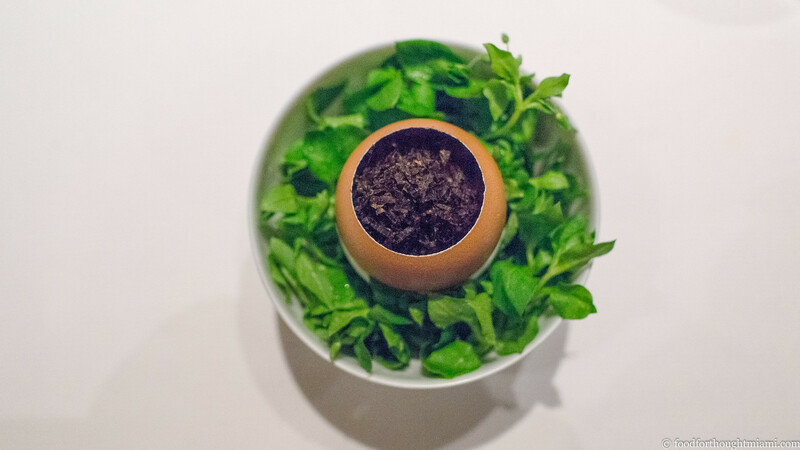 The food menu at All Day, created by chef Charles Lutka, who ran Gigi for the past five years, is very egg-intensive. There are three variations on the theme of breakfast sandwich. The first of these, the "Runny & Everything," combines a sunny-side-up fried egg with a couple slices of bacon, sharp cheddar cheese, lettuce, and a thick slab of tomato, all served on a puffy, everything-spice dusted brioche bun. Though nominally a sandwich, this is – as the name warns – a gooey, fork and knife affair. It was a good combination; I think a sturdier bread might give it a little more architectural integrity, something more up to the task of sopping up that runny yolk. The Pan Con Croqueta was another tasty combination that I wound up giving the Costanza treatment. 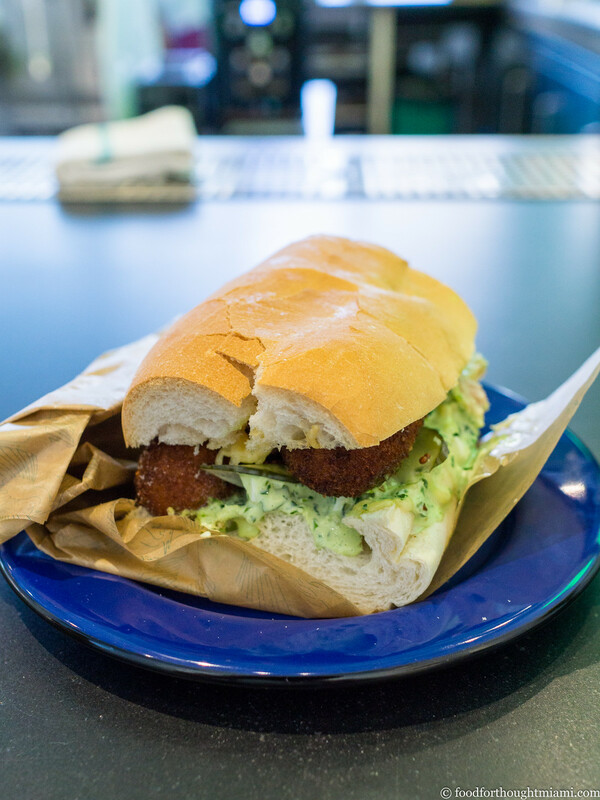 A variation on a Cuban breakfast staple, this sandwich was anchored by a couple plump, crisp-edged pork croquetas, resting atop a runny, green-hued, herb-flecked egg spread, with some gouda cheese for a little extra creaminess and thin-sliced pickles for some tart contrast. Even the sturdier Cuban bread couldn't quite hold together the runny egg salad, though this was another delightfully happy mess. I suppose if I want to keep my hands clean, I should try the "One Handed" next. Every time we do one of these Cobaya dinners, there are always any number of things which can go wrong. We ask the chefs to push themselves, to truly treat it as an experiment; and not every experiment succeeds. We encourage ambition, even when sometimes the reach may exceed the grasp. A dish just may not work, or the execution may falter when the scale goes from a test run in the kitchen to a service for a big group. Then every so often we miss in the opposite direction, and fail to instill the trust or confidence that emboldens a chef to go outside of their comfort zone. Even a very good meal can be something of a disappointment – for us, anyway – if it doesn't offer something different from the usual restaurant experience. 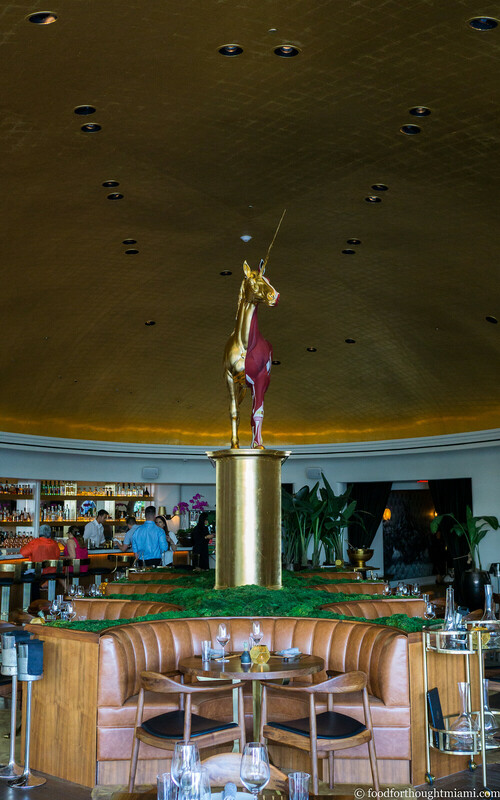 I'd been to Paul Qui's restaurant Pao in the Faena Miami Beach once before, very shortly after it opened (and wrote about it here, where you can also get much of Chef Qui's back story). I had a good meal – some dishes were great – but it felt restrained, like there was a lot more reverberating under the surface. It almost seemed as if he was cooking for this room, trying to match the polish of the gilded (literally!) ceiling and multi-million dollar Damien Hirst sculpture that is its centerpiece. I wanted to see what he could do if unburdened by those expectations, and just allowed to cook. 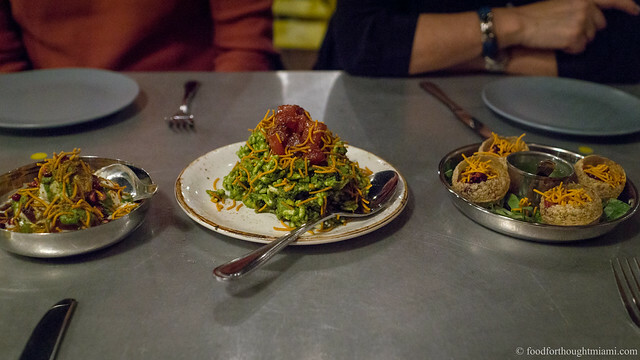 Qui and his chef de cuisine at Pao, Derek Salkin, did exactly that this past Thursday for fifty of us guinea pigs. And this one got pretty much everything right. (You can see all my pictures in this Cobaya Qui at Pao flickr set). After a welcome cocktail, a variation on a blackberry bramble, which some enjoyed on the terrace, we settled into several communal tables to start dinner. A couple small bites to start: first, kumamoto oysters, topped with sake granite, in a frothy puddle with flavors of shiso, umeboshi and tomato. 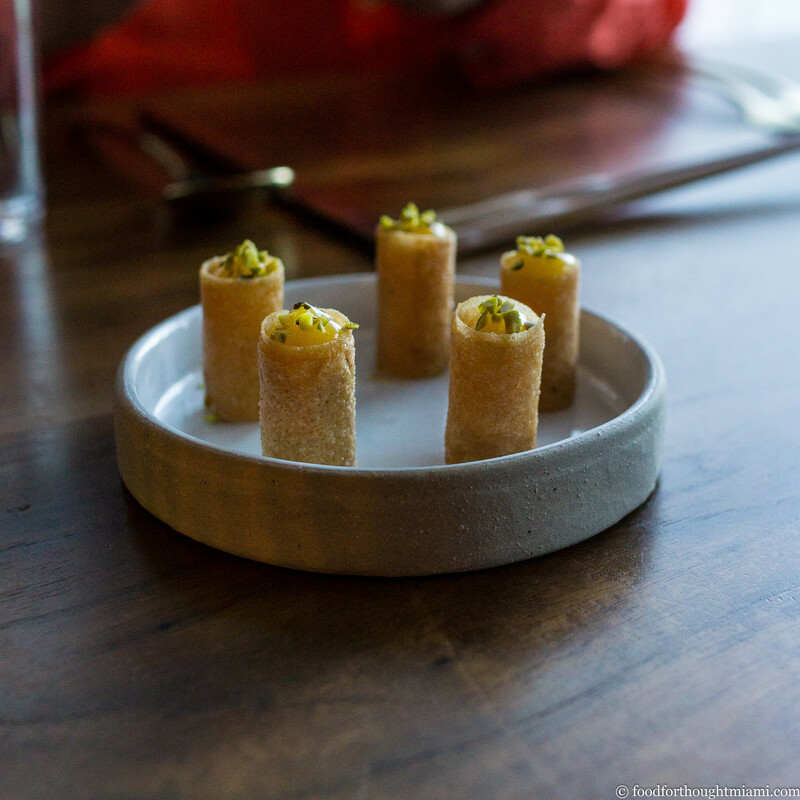 Next, upright lumpia, their crisp shells filled with foie gras, tangy, floral passionfruit, szechuan peppercorn for zing, crumbled pistachio for nutty depth. This first full course was an unusual one, but I liked how it all pulled together. 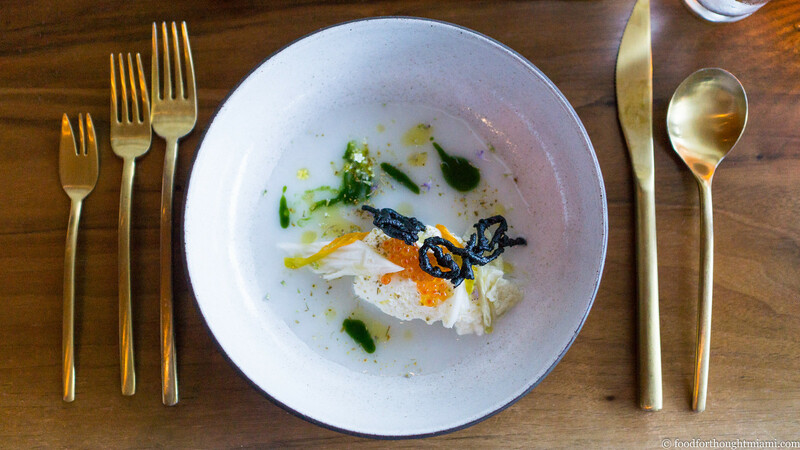 The base of the plate was covered with a film of slippery, silky rice milk, dotted with olive oil, an herbaceous green purée, and flower petals. That was the platform for a scoop of creamy, milky fresh ricotta, laden with shiny smoked trout roe and ribbons of white kimchi, the fermented cabbage adding some kick and contrast. A twisted black garlic cracker topped the odd but tasty composition. Some sort of sound had involuntarily come out of my mouth. I'm not sure exactly what it was; it may have been a moan. It may have been a giddy chuckle. But when I came back to my senses, I saw that everyone on the other side of the counter was looking at me with an expression somewhere between bemusement and shock. Shuko is not a stereotypically austere, somber sushi bar: the soundtrack is dominated by old-school hip-hop, and the chefs fist-bump regulars across the bar. But still, whatever I'd done had caught everyone's attention. 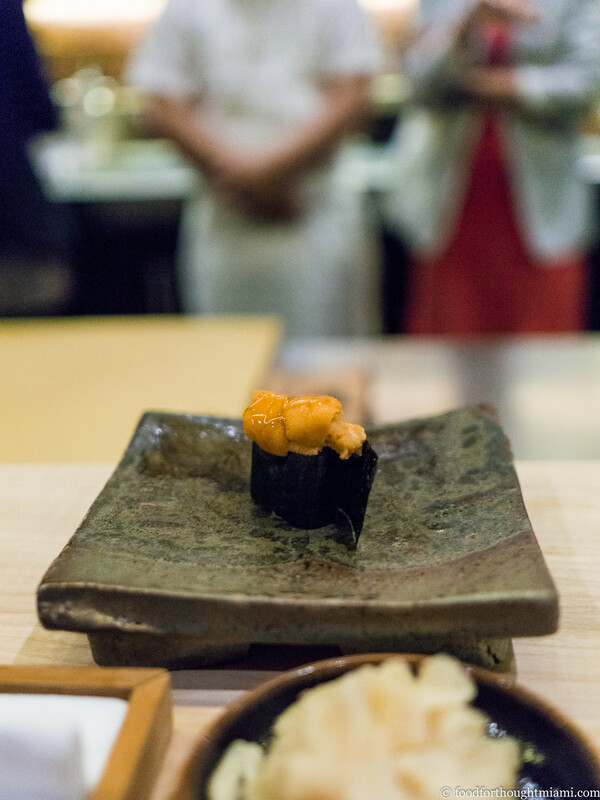 It was triggered by this bite of Hokkaido uni: the lobes of sea urchin cold and creamy, with a flavor both briny and fruity, like an oceanic peach, tucked over a pillow of rice into a gunkan maki of crisp nori. Beautiful stuff, worth embarrassing yourself a little bit. You can see all the pictures from our omakase dinner at Shuko in this Shuko - New York City flickr set. Quince Restaurant is something of an anachronism. In these days of bare tables and and backless stools and leather-aproned servers, here there are still white linens and cushions and tailored suits. Refinement. Elegance. I wasn't so sure I cared about such things so much any more, but a solo meal there a few months ago left me feeling happily coddled like a soft, warm, perfectly cooked egg. It's not just the trappings, it's the entire gestalt of the place: you don't feel so much like a customer as the guest of a wealthy, thoughtful friend. If fine dining is dead, Quince never got around to reading the obituary. I was basically killing time before a red-eye flight home from San Francisco, and Quince might not have been on my radar but for several people mentioning it when I went fishing for suggestions on twitter. Then I recalled that on our last visit to San Francisco, we'd stayed just up the street from its more casual sibling, Cotogna, right in the path of a cloud of intoxicating aromas which emanated from the kitchen every afternoon. So I'd booked an early reservation, and now settled into a banquette (one of the joys of solo dining is getting to sit in the comfy seat) and watched as the room slowly filled. A cut crystal coupe was also filled with champagne, as an assortment of amuse-bouches was brought to the table. (You can see all my pictures in this Quince Restaurant flickr set). 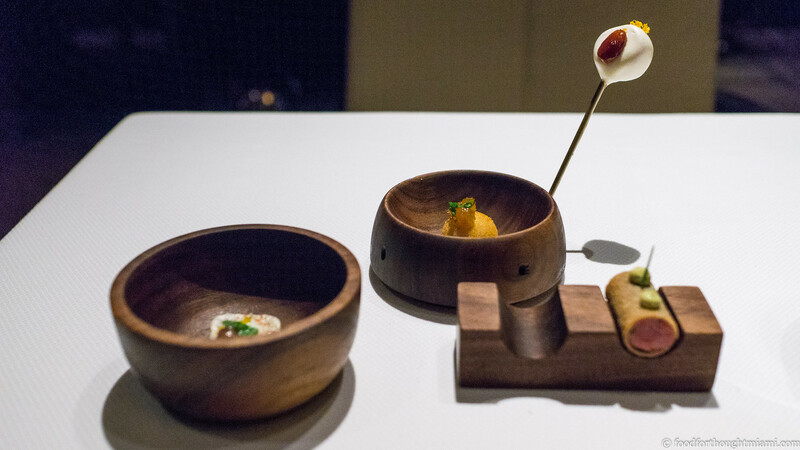 A finely minced steak tartare wrapped within a cylinder of bric pastry, dabbed with a tart gribiche sauce; a bon-bon of pickled persimmon with marcona almonds; a delicate croqueta of jamón ibérico dabbed with sweet onion jam; a featherweight chicharrón cracker, with a delightful crackle. 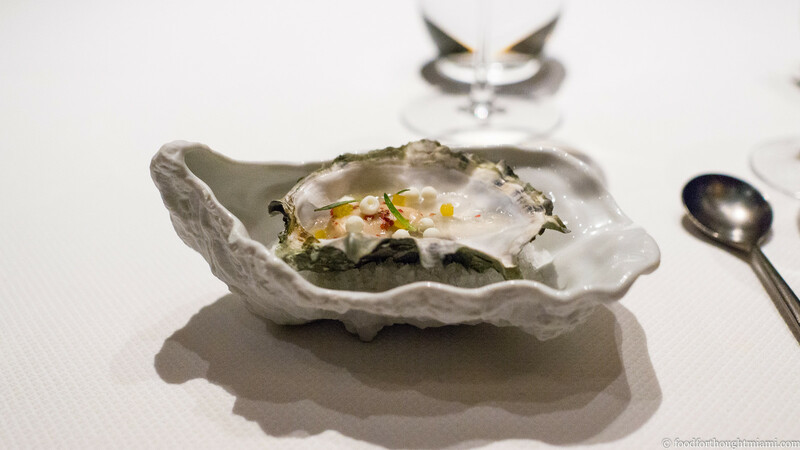 There was a stretch of a few months where every tasting menu I tried started with an oyster. If it's a good oyster, I'm OK with that. This one – from Fanny Bay in British Columbia – was a good one, its fluted shell also bearing some little horseradish pearls, a pink peppercorn mignonette and tiny tarragon leaves (a great accent mark over the cucumber-y flavor of the oyster). 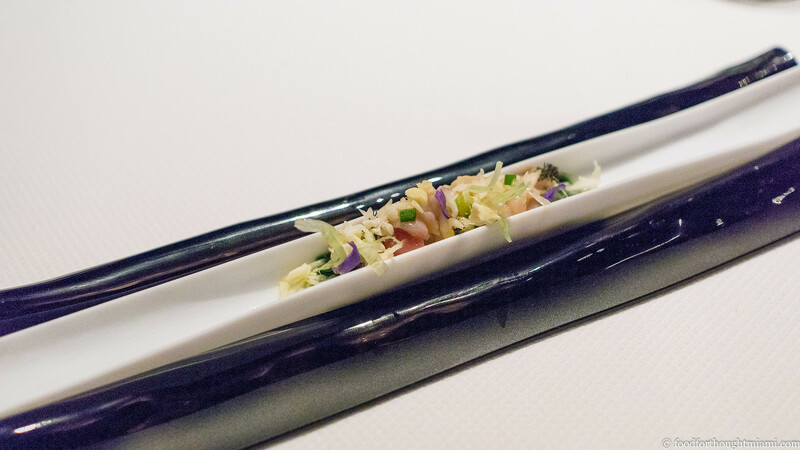 Light and delicate, this little salad of empire clam with purple borage flowers, fennel and meyer lemon, all nestled over a bright green borage leaf purée, arrived in a long, skinny dish reminiscent of a razor clam shell. For an eating utensil, they provided the same item with which it was plated: tweezers. Clearly, Chef Michael Tusk likes caviar. 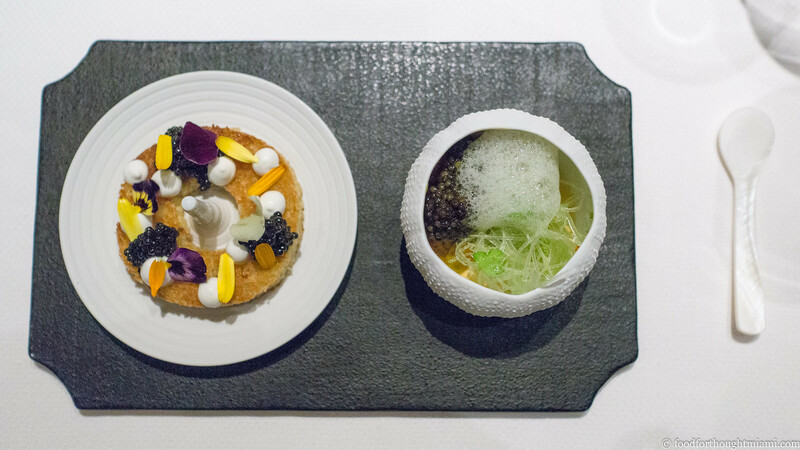 If you're not up for a full tasting menu, Quince has a salon where you can order several items a la carte, including an entire menu devoted to caviar selections. In the dining room, it was served two ways: on one side, a ring of tender brioche adorned with generous quenelles of Tsar Nicolai reserve caviar, buttons of creme fraiche and vibrant flower petals; on the other, a bed of creamy sea urchin, topped with an even more generous spoonful of steely grey roe, with a fine julienne of fennel and apple which provided a beautiful lift and brightness to the dish.